As soon as you enter the Nickelodeon Suites Resort in Orlando (a.k.a. Nick Hotel), you are in a different world. In a world that normally revolves around adults, here kids rule and parents come along for the ride. The Nick Hotel is so much more than a hotel, even much more than a resort. Once you are there, you feel as though you have stepped into a living cartoon. It is a full immersion experience. From the moment you enter, you are surrounded by the bright orange and slime green world that is Nickelodeon. From interactions with Nickelodeon characters like SpongeBob and Dora the Explorer, to the live SpongeBob’s Krabby Patty Celebration, to mass slimings poolside, kids will not want to leave. 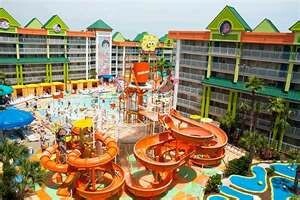 The 24-acre resort contains 777 suites in 14 buildings embellished with Nickelodeon’s signature paint splatters and life-size characters that are centered around two large courtyards, each with a water park and pool area. 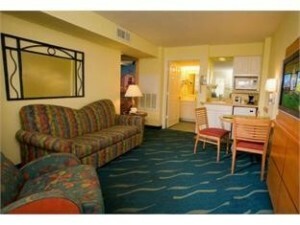 Every guest suite features a separate living room, a small refrigerator, a microwave and a coffee-maker. The kids’ rooms come with either bunk beds or twin beds and feature their own TV which seemed to default to Nickelodeon. The Lagoon Pool features a zero-depth entry heated pool anchored by a four-story water tower with seven water slides, flumes, climbing nets, water jets, and a 400-gallon dump tank. What kid wouldn’t enjoy being showered by 400 gallons of water every few minutes? For even more excitement, the water is turned into green slime several times each day for a mass sliming giving everyone the opportunity to get slimed Nickelodeon style. Each day there are poolside interactive games hosted by the recreation team, where you guessed it, the winners are slimed! For a calmer experience, head to the Oasis Pool where you will find an Olympic-sized pool with water slides, an interactive water tower, a whirlpool and cabanas available for rent. All the action and excitement you could ask for is included with your stay at the Nick Hotel. From basketball and mini golf to pool side parties, families will always find activities under the sun. But if it gets too hot outside, or if the pool is closed during Florida’s daily summer storms, stop by the Mall where you can enjoy character meet and greets, a 3,000 foot arcade, shops or, my favorite, the Kid’s Spa. Where else will you find a high-style spa made for kids with treatments that include manicures, pedicures, face painting, hair braiding and air brush tattoos? Parents can also indulge in spa services that relax and rejuvenate. I am not sure that I would go that far, but every kid I saw had a smile. And so did I.